The first newly styled Dodge after World War II. Everything was new with the 1949 Dodges. Even the names. Dodge finally broke out of the Deluxe/Custom syndrome. Now there was Coronet, Meadowbrook, and Wayfarer. Styling was all new. 1949 Dodges were longer and lower. Fenders were now an integral part of the overall design-not tacked on as an afterthought. The checkerboard grille was widened, and the parking lights were now circular and mounted below the headlights. Displayed is a Meadowbrook series four door sedan, riding on a 123 1/2 inch wheelbase with a fluid drive transmission. Featuring chair-height seats and a soft cushiony ride, the 1949 Dodge was a big, comfortable car, and a lot of car for the money. Production of Dodge cars rose dramatically in 1949, with a total of 298,399 being built. 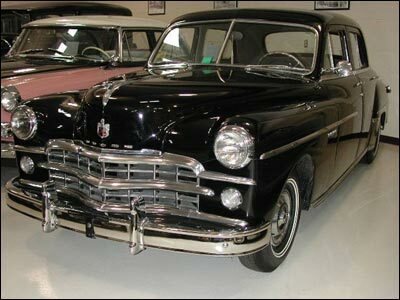 This original and excellently preserved Dodge is part of the Bob Swope Ford Collection. It is the car Bob Swope drove as a student at Miami University.